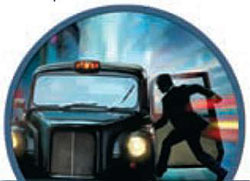 Mister X tries to escape his would-be capturers in London by taxi, bus and underground. You have to be a particularly clever detective to be able to catch him. 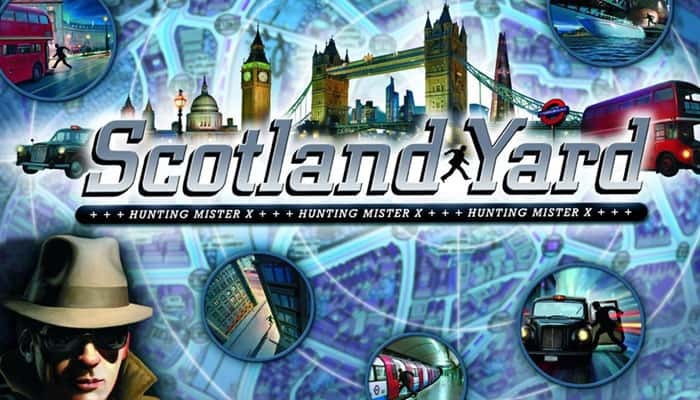 Mister X tries to stay one step ahead of the detectives and keep them guessing at his whereabouts right up until the end of the game, while the detectives try to pick up his trail and track him down. First decide who will play the role of Mister X. Tip: To play the role of Mister X you need nerves of steel, so it's best if the most experienced player gives it his best shot. 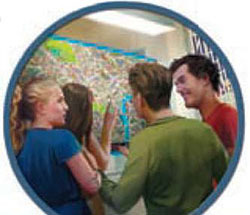 The other players all play the role of detective. Lay the tickets next to the game board before you begin. Note: Mister X picks up normal tickets from the general draw pile throughout the game. 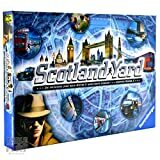 For games with 2 or 3 detectives, both detectives and Bobbies are in play! Each Bobby is represented by one of the remaining playing pieces. Place a cardboard ring around each playing piece representing a Bobby. The ring stays on the respective playing pieces throughout the game to indicate that they're Bobbies. The ring is their free fare for all means of transportation. Bobbies don't require any tickets for their moves! Bobbies are moved collectively by all detectives during the game. The detectives decide together where the Bobbies should move. To determine your starting position, shuffle the start cards according to the back side of the cards (D and X). Shuffle the D and X cards separately, placing them face down on the table. Each detective draws a start card with the D on the back and places his playing piece on the corresponding station. If Bobbies are in play, draw one start card with a D on the back for each Bobby and place its playing piece on the corresponding station. Then, Mister X draws a start card with an X on the back and looks at the card without revealing it to the detectives, but does not place his playing piece on the game board. Tip: The numbers of the stations on the game board are arranged from left to right to make it easier to find your starting positions. Up to 22 rounds are played. 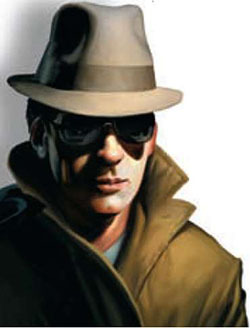 In one round, Mister X first makes his move and then each of the detectives and Bobbies make their moves in any order. Mister X, each detective and each Bobby must change their respective location. For each distance travelled, the detectives use a ticket from their ticket board and put it on the general draw pile. Mister X always gets his tickets from the general draw pile! Reminder: Bobbies don't need tickets. Each place on the map is a station for 1 to 3 means of transportation (taxi, bus, underground). The colors of the stations indicate which means of transportation start and stop there. To be able to use a particular means of transportation the playing piece must be on a station for that means of transportation (the color is in the circle). 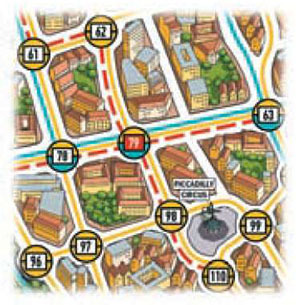 Every station on the map can be reached with the taxi (yellow). However, the distance that you can travel is short: You can only move (along the yellow line) to the next station. 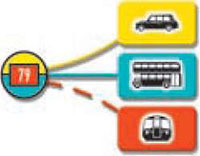 The bus (turquoise) only drives from stations with a turquoise semi-circle; a bus will take you a little further than the taxi (along the bus line). The underground (red) travels along the red line and covers the furthest distances the quickest. However, there are only a few underground stations (stations with a red inner rectangle) on the map. A player uses a ticket with the corresponding color and moves his playing piece to the next station. You can move back along the same route on your next turn. All playing pieces can only be moved to unoccupied stations. If there are no unoccupied stations for Mister X to travel to, he has lost the game. Mister X also loses if either a detective or a Bobby moves to the station where Mister X is located. Mister X conceals his moves. He secretly selects a new station that is connected to his current location by a line (means of transportation). He writes down the number of the new station on the next free field in his travel log. He covers his entry with the ticket that he's just used. The detectives are able to see which means of transportation Mister X has used, but they can't see his destination. On his next turn, he moves from the last logged station to the next station of his choice. Once Mister X has completed his turn, the detectives and Bobbies take their turns in any order. Since the detectives all share the same goal, they should work together to coordinate their moves and the moves of the Bobbies. The detectives all discard their used tickets on the general draw pile and move their playing piece to the chosen station using the selected means of transportation. Reminder: Bobbies don't have to discard any tickets on the general draw pile. Detectives only have a limited number of tickets. If a detective is out of tickets for a certain means of transportation, he can no longer use this means of transportation. If a detective no longer has any tickets or can't move from his current station with the tickets he has left, he has to sit out. Detectives may not trade tickets among themselves. Detectives' tickets always lie face up, so that Mister X can see which means of transportation the detectives have at their disposal. Mister X has to show himself at regular intervals, after his 3rd, 8th, 13th, 18th and 24th moves. The intervals when he has to surface are indicated on the travel log by circled numbers and a larger field. As always, Mister X enters his station on the travel log and covers his entry with his ticket. Then he places his playing piece on his current location. Tip: Mister X should make sure that no one can reach him on the following turn after he has surfaced. The detectives have the break they've been waiting for to finally catch Mister X or to box him in. But there's no time to waste! On his next turn, Mister X will remove his playing piece from the board and disappear again! Tip: Detectives should make their way to the larger junctions before Mister X surfaces to improve their chances of being in the vicinity of Mister X when he does show himself. If Mister X plays a double-move ticket, he can move to two stations on a single turn and with any valid combination of two modes of transportation. He enters both stations in his travel log (2 fields) and lays both used tickets over the fields. The double-move ticket is then removed from the game. If the first station is a station where Mister X has to surface, he shows himself there momentarily and then disappears again with his second move. Since a double move is the same as 2 normal moves played out consecutively, Mister X cannot move to a station that is already occupied by a detective on his first or second move. Mister X may use a double-move ticket only once per round. Mister X can use a black ticket instead of a normal ticket, which entitles him to use a means of transportation of his choice. 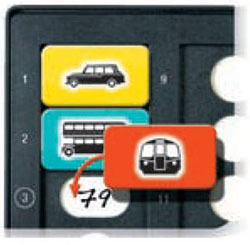 With a black ticket, Mister X (and only Mister X) can also use a ferry (and move, for example, from 157 to 115). This route (black line) can only be used with the black ticket. When Mister X uses a black ticket the detectives cannot see which means of transportation he has used. Black tickets can also be used at the same time as a double-move ticket. They're documented in the travel log as always. 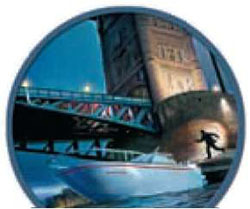 The detectives win the game if a detective or a Bobby finishes his move on the same station as Mister X. When this happens, Mister X has to reveal his location. 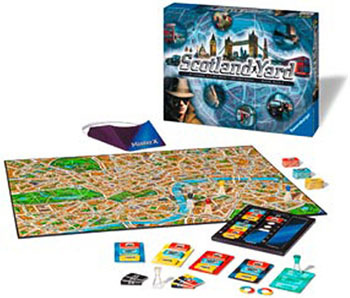 He manages to travel around London for 22 rounds without getting caught by the detectives. The round is only over once the detectives have also comple- ted their moves. None of the detectives can move his playing piece. If only one detective plays against Mister X, 4 playing pieces are in play; two pieces are detectives, for both of which the play- er receives the normal amount of tickets (20 x taxi tickets, 16 x bus tickets and 8 x underground tickets in total). Tickets can be used interchangeably for both detectives. The remaining 2 playing pieces are Bobbies that don't require any tickets. The pieces can be moved in any order the player wants.